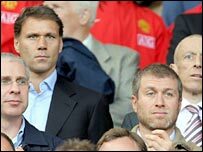 Just for the record, you know, to clear things up, Chelsea have NOT offered the manager’s job to Marco Van Basten. And the Dutch FA says the same thing. Got that? Because I wouldn’t want you to think otherwiseâ€¦ Avram Grant is going NOWHERE. You heard it here first (well, second or third).